Would you go to a dentist if you had serious head aches or needed a brain tumor removed? The obvious answer to that is: No, even though both dentists and brain surgeons are highly educated, work on your head and use drills. But that is basically what the Western Mining Alliance and their suction dredging allies are asking you to do by rolling out Joseph Greene and Claudia Wise as experts on suction dredge mining and the risks posed by that activity to our precious rivers and imperiled salmon and steelhead. Actually it is worse than that because the credentials of these two scientists in their own fields make it more akin to asking a senior and skilled dental technician to dig around in your brain pan. Too harsh? Not really. While this pair of retired US EPA scientists—one a toxicologist (Greene) and the other a physical chemist (Wise)—have certainly provided some good science in their time and in their respective fields, they have aggressively inserted themselves in a debate where they lack credentials and stature; are behaving unprofessionally; and have serious conflicts of interest. While they are certainly entitled to have their say as private citizens and have said it, now they are acting a lot like uninvited and obnoxious house guests who were supposed to spend one night and ended up staying a week or more. Toxicology (Greene) and the physical sciences (Wise) are primarily test tube disciplines and though they share some methodologies and philosophies with field-oriented disciplines like fisheries biology and ecology there are many differences in terms of language, expectations, logic, and awareness. All are valuable fields and their science meritorious but we also should acknowledge that they attract different minds, personalities and professional approaches. In short, having skills and experience in one area does not always directly transfer into another. Now I could go into great detail here on degrees held—which Mr. Greene and Ms. Wise are pretty cagey about—and quality, quantity and thrust of work, but I will use a surrogate device: The New York Times editorial department. Much has been made on the mining blogs of the fact that two PhD-level fisheries scientists—Bob Hughes and Carol Woody—wrote an opinion piece in the New York Times in January 2012 on the need for reform of the 1872 Mining Act which contained a sentence on suction dredging. Mr. Greene and Ms. Wise wrote a rebuttal of sorts and were incensed—along with their cadre of supporters—that their piece was not accepted and printed. The mining community saw this as another example of them not getting a fair shake, but the reality is more revealing. There are several elements at work here. First is that while members of the mining community salute this pair and celebrate their self-manufactured stature, others do not. Most see the supreme irony of a pair of mid-level non-fisheries scientists saying that two senior-level fisheries scientists are “fishes out of water.” The hard truth of the matter is that our intrepid pair simply do not meet the minimum entry level on this issue—i.e., they are not recognized experts in this field in spite of their self-labeling, not even close. Moreover, there is the writing. The New York Times has very high editorial standards. The piece written by Mr. Greene and Ms. Wise is simply not very strong or compelling and has typographical glitches and errors in grammar. They are certainly entitled to grouse about this rejection but in the end their expectations were unrealistic and their execution wanting. “I have reviewed the declaration of Toz Soto filed in support of the plaintiff’s summary judgment in the above-captioned lawsuit as well as the “Summary of Fishery Issues Concerning Suction Dredge Mining” prepared by Jon Grunbaum and dated April 20, 2005. The above comment by Mr. Greene is telling on a number of different levels. First his criticism is unfair and demonstrates insensitivity to the challenges of field versus lab science, i.e., you can control variables in the latter and have to design around variables in the former. He is basically criticizing them for being responsible in their comments and exhibiting prudence. But there is more here because he is also being disingenuous. To explore the depth and implications of this latter issue we have only to look at Mr. Greene’s own publications. To be clear, I am not criticizing this paper nor am I criticizing Mr. Greene or his co-author for inserting qualifying language or speculating in the absence of testing or quantifying doubt about why certain effects were not observed or manifested during their laboratory testing. All this is prudent and what we expect from experts. What I criticize is his calling out other scientists for engaging in the same exercise and making this seem—at least to his “audience”—something unusual, underhanded or compromising of their expert conclusions. Mr. Greene’s attention to detail is often lacking. Whether this is just a question of lack of rigor or some larger issue is not completely clear. He has made the above erroneous statement repeatedly in letters and other communications. This and other easily verifiable misstatements have been brought to his attention, and I can see no evidence of self-editing. As science is constantly evolving and becoming more complex, we all frequently adjust our comments in light of more current findings. When one does not do so, there is a problem. My sense is that Mr. Greene is driven much more by his hobby and politics than science. The field of science is full of egos, but rarely do you see them get as out of control as the above and with less reason. Mr. Greene frequently talks about his 30-year experience and 14-page resume, but is very elusive about basic information such as where he went to school and what degree or degrees he holds. In the world of science this is not normal. We talk openly about our degrees and publications. Perhaps Mr. Greene is unaware that since he entered college in the late 1950s that all sub-disciplines of the biological sciences have become more quantitative in their approaches. Yes we still talk about “Physics envy” but that is not because we lack quantitative skills or understanding but rather that we have to work much harder and use increasingly complicated statistics and multivariate analyses to answer our questions in situations where we have little or no control over the variables. Reviewing Mr. Greene’s body of work, I see scant employment of these higher order analyses, certainly nothing to justify his vaunted opinion of his skills versus those with more advanced credentials that he frequently criticizes. And now we come to what brings our two retired scientists to the dance in the first place—they are both officers in the Millennium Diggers organization. In addition, Mr. Greene, his wife and partners owned mining claims in Oregon totaling several hundred acres of federal public land. So they are participants and at least one of them was financially vested in the outcome of this debate. That for me and many others raises red flags about their participation in this debate and the relative value of their input. Now I understand as a fisherman and one who frequently uses waterways for other forms of recreation that I have a vested interest in this issue and therefore a conflict. I freely admit that my views are colored by my recreational activities, that said, I think my situation and that of other anglers in the conservation arena differs. How? I think it is a matter of our relationship with those waters and our attitudes towards what I would call mitigating stewardship. I do fish, raft, and kayak but I spend more of my spare time restoring and caring for those resources than I do utilizing them. My wife and I, for instance, have been on more weekend river clean-ups or riparian tree plantings than we have been on fishing trips. When I lived on the Chesapeake I planted way more oysters than I ate and when we lived in Santa Barbara we dedicated more of our free time to habitat restoration or other actions that raised public awareness than we did enjoying our past-times. Yes, suction dredgers like Mr. Greene remove some fishing lead from waterways but that is a byproduct of materials movement and gravity, not proactive stewardship. Mr. Greene’s version of proactive stewardship appears to be his lobbying actions to make sure that cars, trucks and OHVs are still allowed to drive through the waters of the cherished Chetco River. He argues for this—as he typically does—via a misleading statement about documentation of damage. 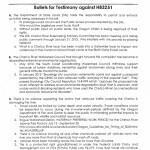 Yes there is likely no specific science indicating that vehicle traffic is harming the Chetco. That is very different, however, than saying vehicles driven through the river are not compromising water quality or harming fish habitat. There is a body of science with sufficient scope of inference to conclude that driving vehicles through most waterways impacts fisheries. As humans we would hope that we would be able to learn from the missteps and mistakes of others rather than having to do the same ill-advised actions time after time. “There is no science showing oil and other chemicals washed off vehicles harm the river any more than that of chemicals that wash off roads. The State Fish and Game [sic] Department has never investigated industry along the river because fish survivability has never been impacted.” Joseph C. Greene Research Biologist USEPA Retired. The above is a novel, school-yard argument, but how is it in any way biologically defensible? Something does not have to be worse than something else to have an impact. It is biologically prudent to minimize road runoff just as it is biologically prudent to keep vehicles out of waterways wherever possible. The two are not in conflict nor are they mutually exclusive. 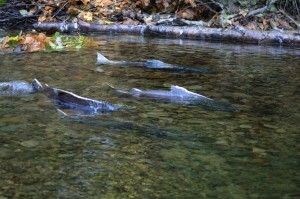 Further the state agency is the Oregon Department of Fish and Wildlife rather than “game” and it looks like Mr. Greene has failed to notice the general decline in native salmon fisheries over the last fifty years which happened during the time that vehicles were driving through the river. “This issue is best left to the local residents of Curry County. Please vote no on House Bill 3251.” Joseph C. Greene Research Biologist USEPA Retired. This last section is also interesting. Perhaps Mr. Greene forgets that he lives in Philomath which is Benton County not Curry. 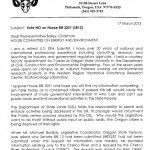 Further this bill deals with Oregon state lands not Curry County’s, and we have fish that are of concern nationally and internationally. All of this demands a broader public involvement. The Endangered Species Act and other similar pieces of legislation are rightfully designed to give the benefit of the doubt to species that are on the list because they require special protections. The Act does not say that all actions can take place unless they are proven to cause harm—there is an element of the precautionary principle (i.e., first do no harm) explicitly woven into the Act. This is a thread or theme that seems to escape Mr. Greene and Ms. Wise which is interesting given that so much of what the USEPA does unfolds in a similar fashion—i.e., proceed with caution and require reasonable proof of safety prior to use. Certainly they and their colleagues in the mining sector have provided studies that indicate minimal or temporary harm. Fair enough, but there are also many studies that indicate actual harm to individuals within an imperiled population, their supporting food cycles, or the variety of habitats they need to survive. Fisheries scientists and other toxicologists (when it comes to the release of sequestered mercury) are simply exercising the same prudence and commendable caution exhibited in the above cited paper on fabric dyes or the cautionary wording included in Ms. Wise’s work with Douglas firs and elements of climate change. This above caution should also be anticipatory. Suction dredging permits in Oregon have doubled recently. And there are groups in California and elsewhere such as Gold Pan California and The New 49er’s that are looking to maximize the number of permits through schemes to put multiple permit holders simultaneously on claims—sort of a condominium scheme that seems hardly legal or ethical. Should not the most responsible action of any legislature or agency seeing a rapid rise of any activity with negative or unknown consequences be to say “time out” until more is known? “THIS IS REALLY IMPORTANT- they [Gold Pan California] want you to sign in as joe public and NOT AS MINERS. Create a name like "naturelover2" or "fielddreamer" or "soccermom" or something that makes you sound like you are the public and NOT MINERS. They want you to make pro-miner comments, but not to the point that you sound like miners- they want it to sound like you are the common public standing up for the miners. There needs to be a lot of buzz on this so it gets picked up by bigger and bigger press. The more buzz we create about the topic, the more exposure it will get.” E-mail by Rick Solinsky suction dredger and co-founder of Western Mining Alliance. The Western Mining Alliance itself is a castle of deceit. Its “.org” designation makes one think that it is a benign 501(c)3 non-profit organization though it is not registered as such. Its president goes by the moniker of Molon Labe which is an alias. Molon Labe is the phrase reportedly uttered by the Spartan king Leonidas to the Persians at Thermopile. It basically means “come and take.” It seems in poor taste that this modern day small force that aggressively promotes bad science, loopholes and subterfuge like the above has elected to use this phrase that is associated with one of the most straight-forward and courageous acts in history. But I suppose in all of this gold fever and greed often bring out the worst in mankind. Express support for moratorium until the science indicates that suction dredging is safe for salmon, steelhead and supporting aquatic ecosystems. What is your Education,Mr. Ferris,look's as tho A "Fiction Writer"
My credentials are accessible–like most professional scientists of standing–through a link on my profile on this site and are applicable to this discussion (see About Us section). Neither Mr. Greene or Ms. Wise are similarly forthcoming. Do you notice some fundamental differences? All of the crap that you have put forth is just that. California is trying to take 2 million acres to protect the yellow legged frog from the hands of humans when it is frogs that are causing the extinction. Why would letting them have their own habitat do for them if they are dying from transmitted disease from the costal song frog? Nothing. Have you ever stepped outside your back door and had frogs all over your patio, bet you have, they seem to thrive with human intervention. All of this hockypuck about dredging causing fish decline is bull also; fish count has only changed because of over fishing and gill netting not dredging. How can anyone in their right mind feel that dredging causes decline when you have millions of fishermen catching all the fish, dredgers don’t catch fish they feed them. And what exactly is your point? All professional scientific societies that have been asked oppose the practice of suction dredging. Suction dredgers have been able to dig up a couple of retired (i.e., they do not have to protect their credibility) scientists from another field to support them, but that is all. The name is cute but you have in no way materially rebutted or provided evidence that my conclusions were in error. adverse effect on a natural community (HWE 2011). Dave, While I am pleased as punch that someone from Denver has taken an interest in this more than a year old post. 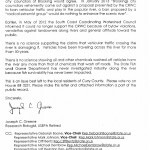 The FONSI argument (http://www.cascwild.org/fonsi-not-fonzie/) been kicked down the road repeatedly because it does not mean “no impact” and because it depends on dozens of conditions being met by a group of individuals who are poorly monitored and generally take a jaundiced view of regulations (see http://www.cascwild.org/suction-dredgers-release-the-mccracken/) in any case . Should this group be trusted to voluntarily follow regulations? The answer to that is a resounding: no. Sorry Bob, looks like you have missed the mark again. Twice. I read the McKraken piece before this one and was a bit taken back that a man of science would stoop to petty name calling sprinkled with more intelligent comments. So when i read this drivel where you again disperage those you disagree with I shot off a snide note that it was more appropriate for Facebook. So if "no impact" is the standard by which you want to measure, do you want to eliminate fishing altogether? Surely anything less would not result in "no Impact" Or are you implying that fishermen and women are the poorly monitored individuals that take a jaundiced view of regulations? Or is it just your opinion based on your own bias that because these prospectors don't do as you say they should not be trusted? The fact that these miners have been able to stay one step ahead of the regulations is an indication of the weakness of the rulings, or an indication of their perserverance, but not a condemnation of their chracter. Before you ask , no I am not a member of the 49ers, or any other group. And I dont live in Denver, never have. Havent even lived in the US since 2009. Your opinions and resolute stance on this issue reminds me of "creation science" adherents. In spite of an overwhelming pool of evidence to the contrary, you cling to the belief that your understanding of the facts is the only true answer for the believers. Could you please explain why the state of California has decided to use suction dredges to remove 150 lbs of mercury from Combie lake if this method is so dangerous? And were you aware that the company will be able to keep the gold it recovers as a by-product of this mercury removal? It would seem to this distant observerer that the mckracken should start a non profit "adopt a waterway", akin to the adopt a highway. They could remove litter such as lead and mercury from the rivers and streams, cash in any recyclables they find such as aluminum cans or gold and even get a tax exempt status as fervent environmentalists. Hows that sound? I am a scientist but I am also an angler and a citizen. That means I know that Mr. McKracken has caused actions that are harming the fish that I and others are trying to protect and restore. He has also done so in a bullying manner and by flaunting and ignoring laws and regulations. I therefore resent both his actions and methods and said so.